This month we are treated to the pre-Rafaelite Renaissance inspired painting of Madonna Pietra degli Scrovigni. 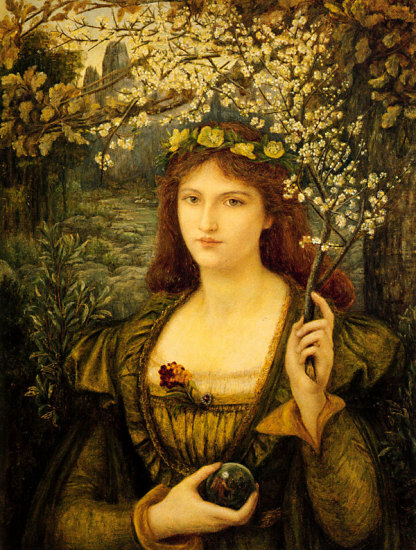 This cold and heartless woman is depicted in a stunning green dress with flowing auburn tresses in a woodsy setting. 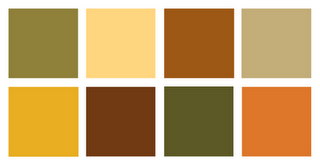 The colors are perfect for fall. As always, I am blown away by the creativity that is running amok in the ABS community! This necklace (above) is fit for a princess. A pre-Rafaelite princess. Kelly of Mackin Art really nailed it, don't you think? 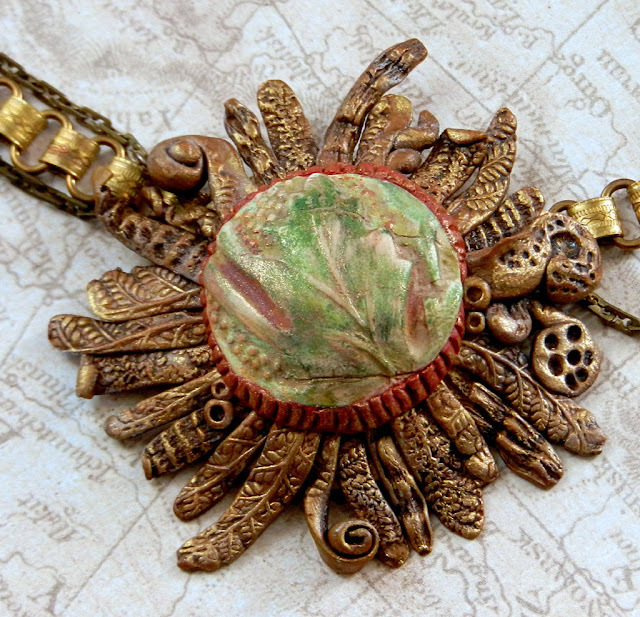 From the intricate right angle weave, to the real peridot stone embedded in the bronze clay flower pendant, I can totally see the lady of the painting wearing this, can't you? And I learned a lot of history of the artist herself by reading Kelly's blog post. Fascinating! Hope gives us a lesson in using buttons as part of your jewelry making in her blog post on Crafty Hope. The button in her focal started out as a mistake, but then Hope saw the potential as it matched so well with an art bead just lying there. Success! Etching, stamping and polymer clay in the rich palette of fall become magic in the talented hands of Miss Natalie (above) of Grubbi. I love how deeply etched the design is on the copper bracelet piece. It looks like it would be very comfortable and stylish to wear. Lynda Moseley of SC Diva went for full-on romanticism with her beautiful polymer clay transfer bead of the woman in our painting. The design is very much in keeping with the Renaissance feel and the colors are so muted and elegant. Check out her blog to read more. Thrift store inspiration is some of the best. 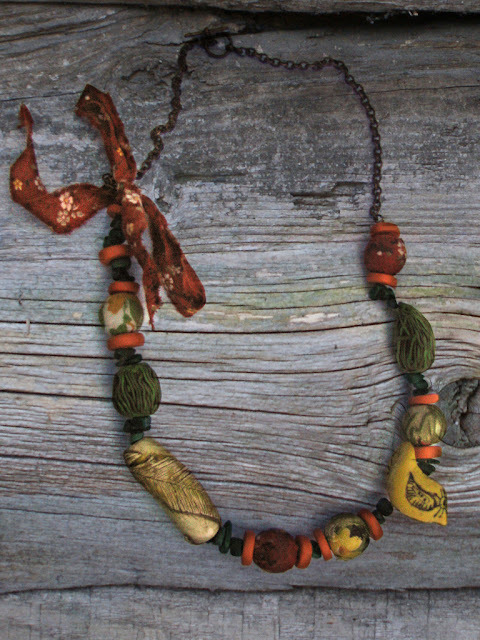 You can find some great treasures there that pair perfectly with any art bead! But you have to have a vision of what those cast off treasures could become. Fortunately for us, T Rose Leigh of Glory Hound Designs is just that sort of inspirationalist! Check out her beautiful bauble on her blog. We are so glad to have all the support of the designers and artists in the Art Bead Scene community. It gives us all great pleasure to see the ways in which you are inspired. 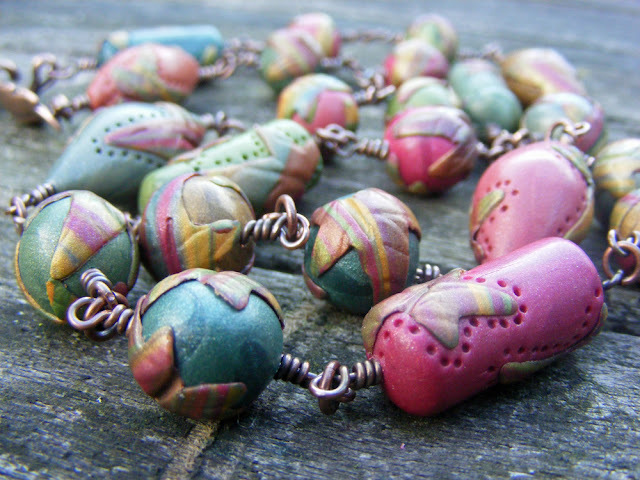 Miss Pippa of Pips Jewellery made each of these pretty polymer clay beads (above) in her challenge piece. We hope to see more from you, Miss Pippa! Bringing in the deep dark of the woods and the bright dancing leaves, Miss Hazel Ward of Continuum Designs crafted some beautiful flower and leaf beads for her necklace. The finishes are what makes this necklace come alive! Isn't it wonderful when you have the perfect piece in your collection just waiting for inspiration to strike? Miss Kym of Kym Hunter Designs won a gorgeous connector that was just waiting for this opportunity. A very modern take on a Renaissance look. I love it! A beautiful interpretation of the colors and the sweet little flower on the branch were the inspiration for Miss Cece's earrings (above) of The Beading Yogini. I like the fiber that reminds me of the fair maiden's long auburn locks and wire wrapped centers of the flowers. 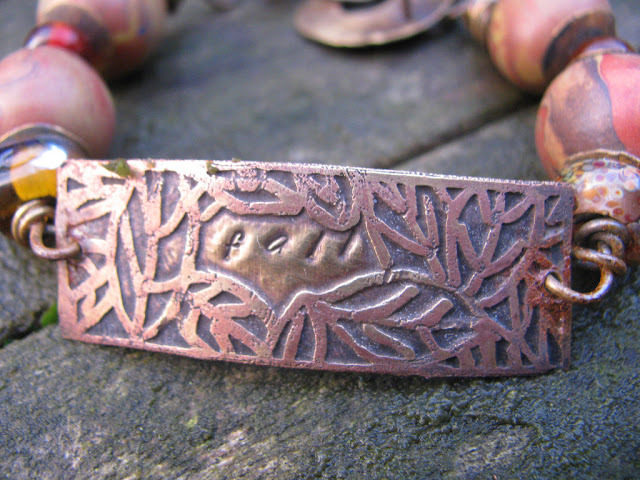 There is a great synergy happening in the bracelet that Miss Malin in Sweden created. She married two different yet equally stunning polymer clay beads from two different but equally talented bead artists with a simple knotting technique that really allows those beads to shine! If you know someone more 'thin-wristed' this would be the perfect Christmas present! ;-) Check out the inspiration here. 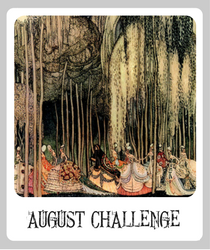 Welcome, Miss Sharyl of SharylsJewelry to the Art Bead Scene challenges! Miss Sharyl decided that the lady of the painting needed to have some jewelry of her own - I mean, just look at that naked neck screaming for some Renaissance bling! The colors match the palette perfectly and this looks like something the Madonna would wear for her sitting. Layers of meaning are infused in all of Miss Christine's pieces (above). The way that she manipulates her medium and blends it seamlessly into a fusion of old meeting new is so fascinating to me. I am delighted to read Miss Christine's blog at Stories They Tell to learn of her processes and thinking. Truly magical! Keenya of The Cranberry Studio was inspired early to make some beautiful paper beads for the challenge. These earrings are a very modern look and so very eco-chic! Picking up on the way that sunlight dapples through the leaves, Miss Angela made a necklace that is fit for a princess in her Green Madonna. The clever construction and mix of materials makes this a remarkable design. Blending the work of different bead artists might seem daunting, but not to this talented designer! 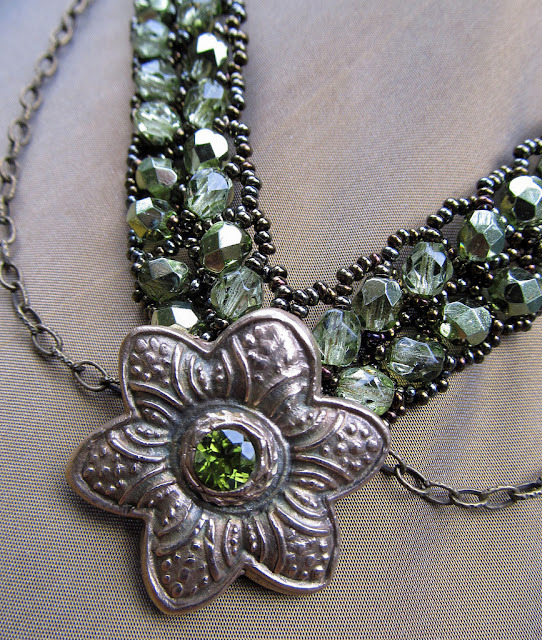 Inspired Adornments brought out the best in all three with the movement of the flowers, the softness of the fabric and the whimsical flower and butterfly beads keep your eye moving over this beautiful necklace. 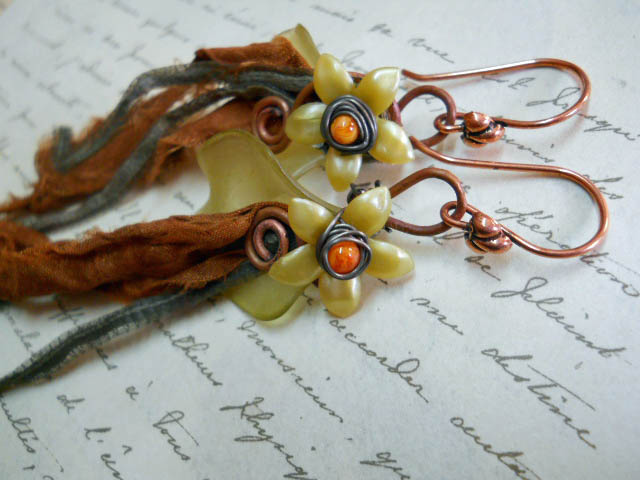 The shimmering white blooms were the inspiration for this lovely bracelet by KlassyJoolz. I can imagine our lady wearing this pretty bauble in the painting! Stretching yourself is what the challenges at ABS are all about! Miss Katherine of Catherine's Dreams pulled inspiration from the green of the dress, the white of the skin and the beautiful foliage in the scene. Thanks for letting us push your creative limits! I am always in awe of what Miss Molly Alexander of Beautifully Broken Me (above) pulls from the inspiration pieces. This month is no exception. The heartless woman is truly a jealous, tortured soul and Miss Molly made the most amazing focal for her necklace. Look at the green patina on this! And the stitching on the heart! Maryann Melo of Middle Earths was sucked into the ABS vortex once again with the lovely olive greens and earthy browns of the palette. She wasn't intending to participate, but we are so very fortunate that she didn't listen to that voice and pushed on through with another lush and lovely interpretation! Showing a beautiful step by step on how to transfer an image to clay, Lizards Looks brings a beautiful romanticized Renaissance lady to life in her bracelet. Someone at the Christmas party will be very lucky indeed to win this beauty! 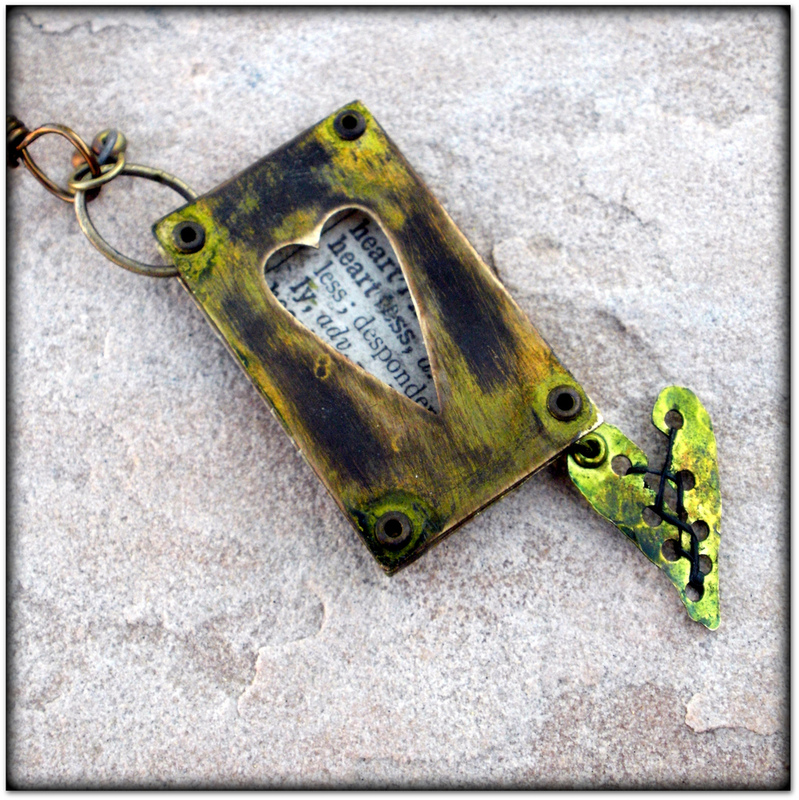 The Clayin' Mommy made a beautiful frame pendant with carved polymer flowers that suits the woodsy palette of this month's inspiration perfectly. Thank you so much for sharing your beautiful interpretations of the November challenge painting with the Art Bead Scene community. Your enthusiasm and excitement always get us energize to keep bringing you more fun challenges and beautiful inspirations. Check back in for information on the fun happening at Art Bead Scene for the month of December! What a fantastic array of pieces! We have some truly talented women in our midst! So many stunning and exciting pieces. So much inspiration. Erin, you're just a little bit of everywhere today, between this and the color challenge! This is a beautiful collection of work - thanks for curating it for us to enjoy! Thanks for adding me tot he Blog tour. I feel so honored to see my necklace among so many talented artist's work. Thanks so much for including it. Can't wait for next month's challenge. Thanks for the mention and the link! I had a lot of fun designing this piece - then the piece had a lot of fun taking the design in a slightly different direction. There are some truly beautiful piece this month! What inspiration! I really enjoy this feature. I find it so inspiring to review each month's wonderful,unique entries. Can't wait until next month ! Wow, so many beautiful creations - so much talent! Thank you for including my necklace - that has made my week!